Restaurants come in all shapes and sizes and as a general rule the swankier the exterior and interior the higher the expectations in terms of the food on offer (and the price they charge for it). The saying goes we eat with our eyes and our minds correlate fancy interior and exterior design with fancy food. 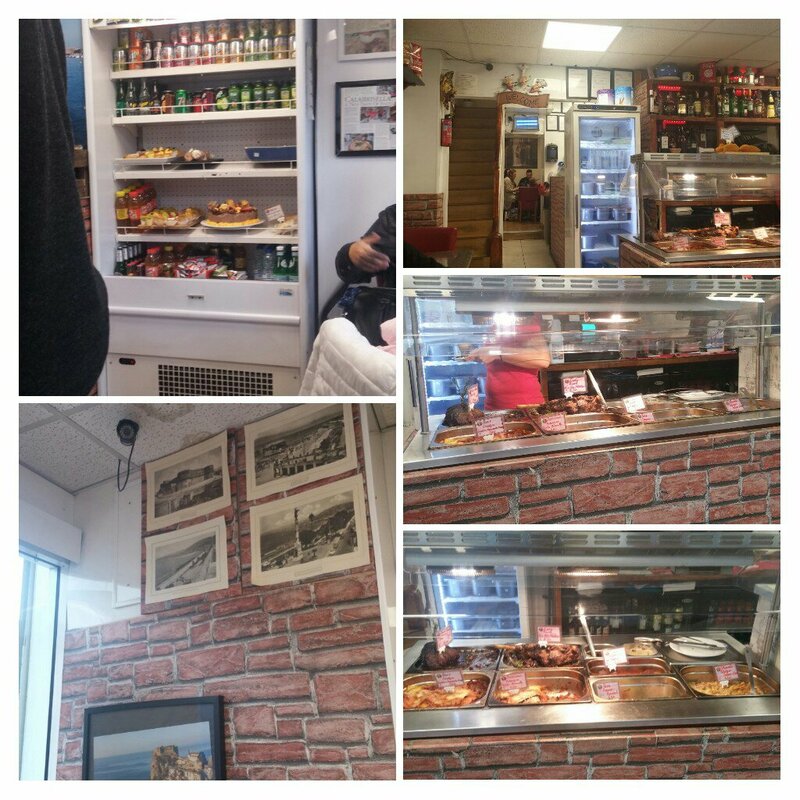 Conversely, we equate places that look, on the face of it, like a high street greasy spoons with food of just that ilk. We may well walk past such places on the assumption that that is all they are about. My view is by doing so we may be missing a trick. Sen BBQ in Canton is such a place – looks nothing more than a late night kebab takeaway haunt from the outside but in the back room meaty delights at bargain prices (and free corkage) await. 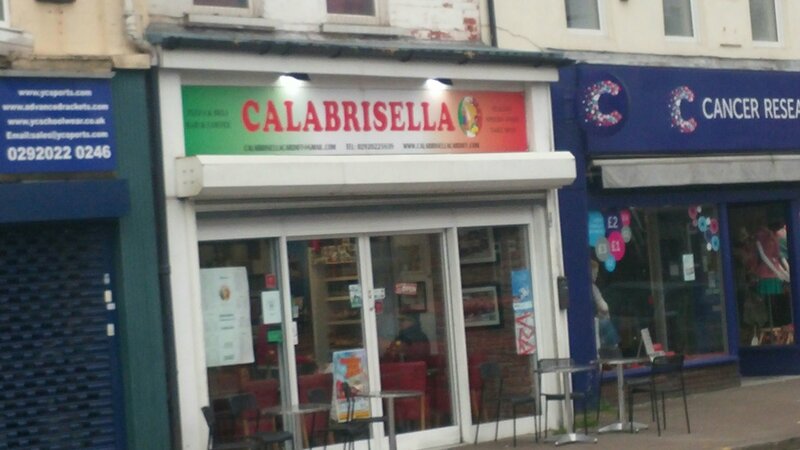 This brings me to Calabrisella, again in the Cardiff suburb of Canton. It looks like nothing special (and that is being nice) on the outside, but Cardiff blogger reviews and Tripadviser suggest this is not a place to walk past out of hand. I have heard tell that fab pizza, pasta and other Italian loveliness can be had here and a Bank Holiday weekend gave Mrs. SF and I and some friends the opportunity to test that old adage of “Don’t judge a book (libro in Italian) by its cover”. 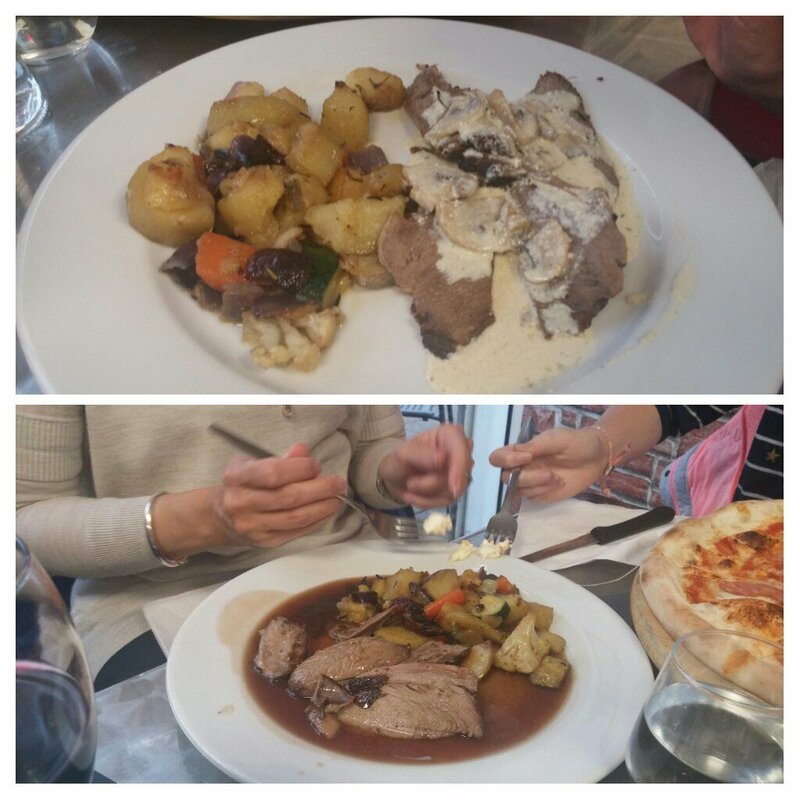 When I said there was more to it than that, that is was a proper Italian restaurant with space at the back and upstairs, she expressed first doubt and then surprise. The decor is certainly interesting. I have always wondered who buys fake brick wallpaper and now I know. No matter if the food is good and I know from experiences (in places like Malaysia) that places that look very (and I mean very) unpromising on the outside often offer hidden delights. 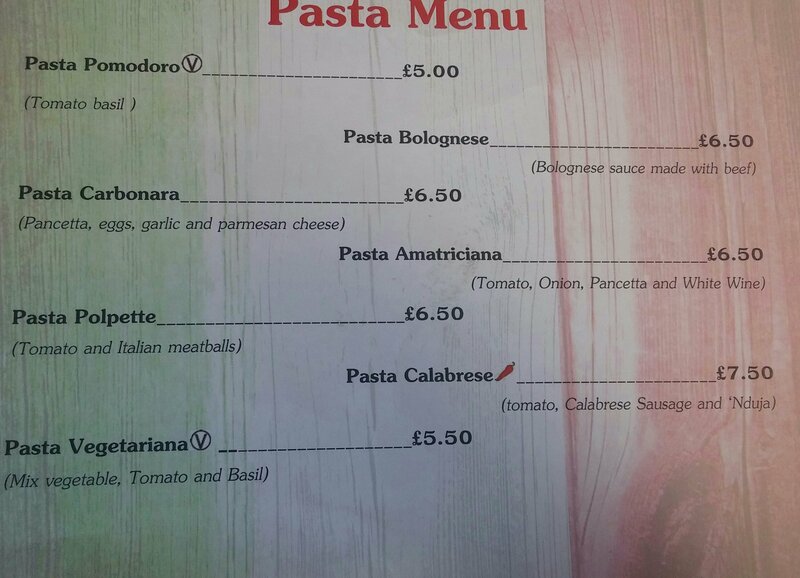 You generally know you are on to a good thing in an Italian in the UK, when the predominant language spoken by customers is Italian. Here there was a pleasing background babble of Italian. It was packed at 6pm on a Bank Holiday Monday, with people being turned away (my advice is book). We regrettably were seated in the “it looks like a high street cafe” bit in the window by the funny sliding door than seemingly no one coming in or going out was capable of closing properly. I watched with some amusement and not a little bit of “there by the grace of God go I” as someone mistook the sliding door for a conventional one and spent a good 30 seconds of bafflement trying to open it outwards then inwards before the penny dropped. This entertainment sort of made up for the intermittent blasts of frigid Bank Holiday weather that came with sitting in the front by the sliding door that no one could close properly. Nice to see on the menu a carbonara with no hint of cream not that this place advertises itself on any pretensions of slavish authenticity. All tasty enough and a big portion, but it didn’t really excite. A cured tuna dish (down on the menu as breasola – £7.50) was more on point. 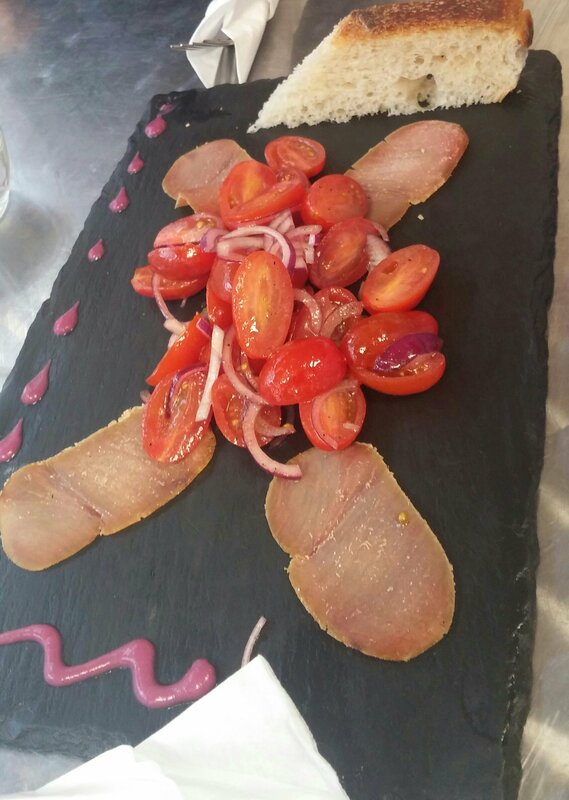 Nice wafer thin, intense, salt dried tuna (not over cured) came with a refreshing (nicely dressed) tomato and red onion salad. No idea what the purple stuff was. 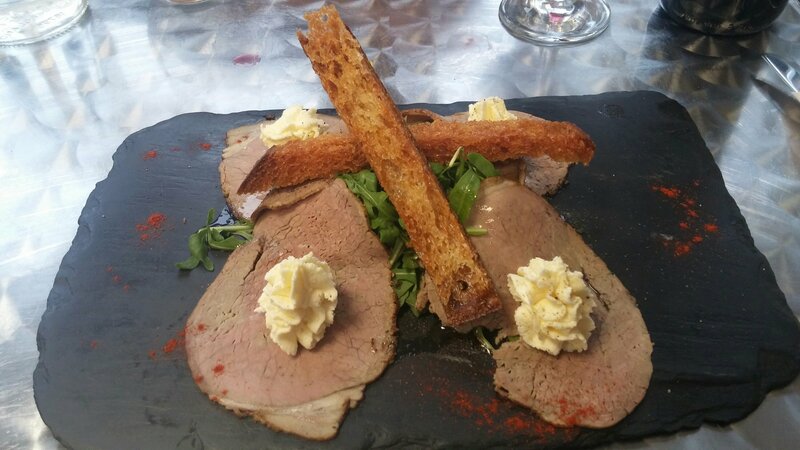 I went for the beef with parmesan cream and rocket. This came with some very pleasant fried bread sticks and some nicely dressed rocket, but I would have preferred the beef a lot rarer. The parmesan mousse also lack somewhat on the parmesan front, which was a shame. Nice, if (like the antipasti) a little pedestrian. 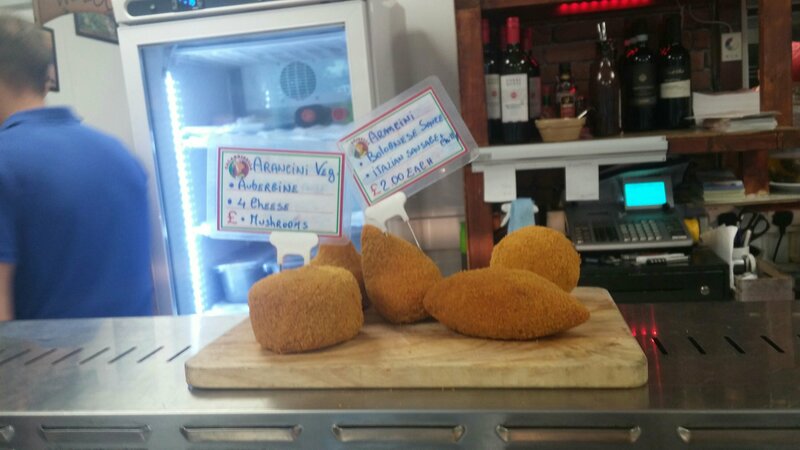 The stars of the starter show, by a country mile, are the arancini on offer here. We ordered an Italian sausage and a bolognese one. Crisp on the outside and well (not over) cooked on the inside, with silky (rather than claggy) risotto rice and a good filling in each, these were top-notch. They were also huge and an absolute bargain at £2 a pop. 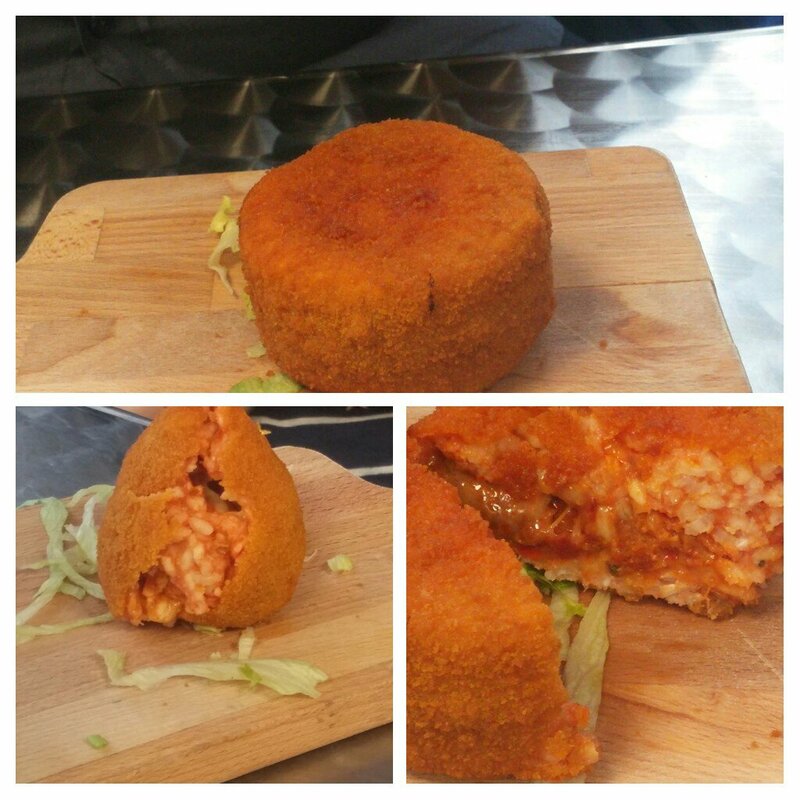 With hindsight, I think we should have just ordered a selection of the arancini for the table. I will definitely go for these next time. 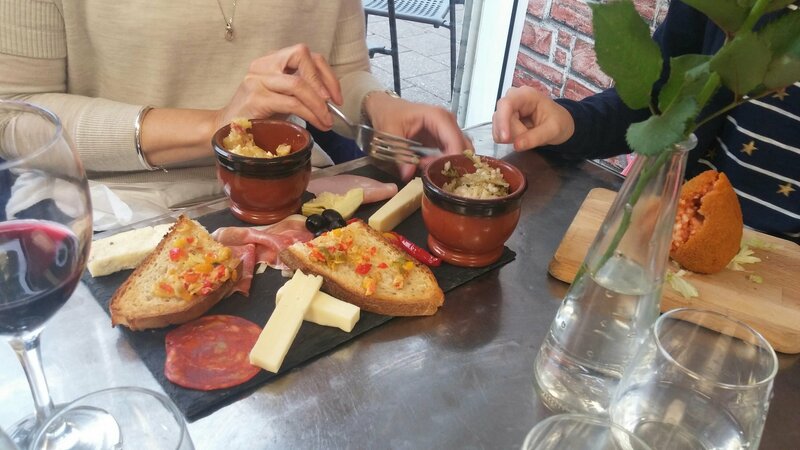 Starter were a bit hit and miss (arancini very good, tuna pretty good, beef and antipasti a little lacking in excitement) and were all served on dreaded slates or boards. Really what is wrong with a bloody plate. 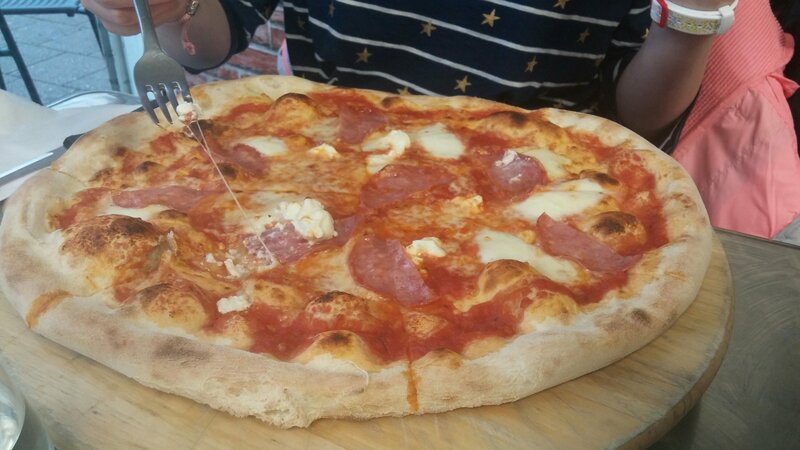 Next up were the mains and whilst the specials were tempting my friend’s teenage daughter and I went for pizza (whopping numbers at 14 inches – why are pizzas never measured in centimetres in the UK, we went metric ages ago?). 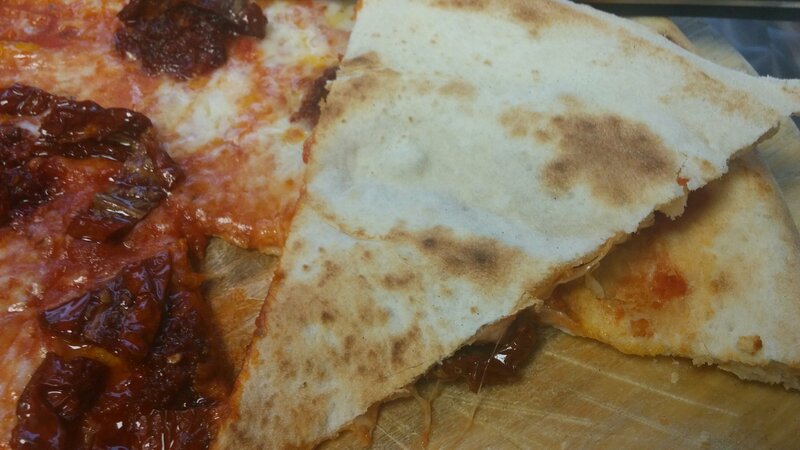 Both were very good, with a nicely flavoured base marinara sauce and enough mozzarella. I went for the place’s namesake number (£11.50), which came with njuda and sun-dried tomatoes. I loved the fiery njuda, but thought the sun-dried tomatoes a step too far. Njuda is oily, rich and intense stuff and so are sun-dried tomatoes and I thought they clashed a bit – vying for supremacy rather than complimenting each other. My view is that it would have been better with just the njuda. 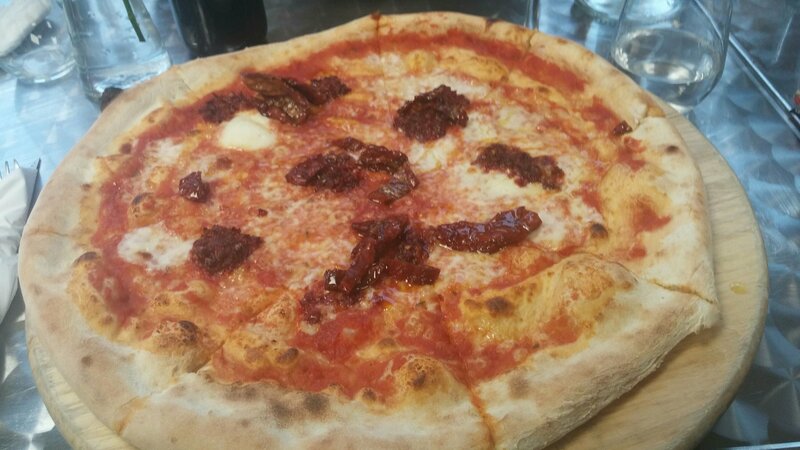 The Milano pizza (£9.50) was a much more balanced number and was met with a big thumbs up by our friends’ daughter. She did, however, to my horror profess regret at not noticing and thus ordering the Americana pizza on the menu, which had chips and hot dog sausage on it. An abomination to me, but irresistible it seems to a 13 year old!!! They clearly know their market and if it sells then why not (especially as claims of authenticity don’t appear anywhere on the menu etc.). Beautifully tender lamb (cooked a touch over for me – but fine for those who ordered it) got vigorous nods of approval when I asked if it was nice . Good value for £8 I thought. The last main was a beef ribs dish. It was “eat with a spoon” tender and was pronounced an absolute triumph by the chap who ordered it. Suffering food envy, it looked to me to be the pick of what got delivered to our table. Unctuous is perhaps an overused term in describing food, but it is the perfect adjective for this dish. Cooked low and slow for an eon (Masterchef contestant take note – you cannot cook beef ribs in an hour and a half), this dish did more than justice to the great (and not too pricey) cut of meat that is the beef short rib. It sat in a fabulously glossy, rich Nero D’ Avola sauce. Lovely dark fruit and peppery flavours from this stuff complimented the beef beautifully. My friends view was he could have quite happily eaten a vat of the stuff. Top draw cooking here. Only thing I wasn’t sure about was where was the advertised (on the menu description) pumpkin pie? Chunks of the stuff evident (and very pleasant) but no pie of any description. I passed on desserts, with what was on offer being fairly limited. 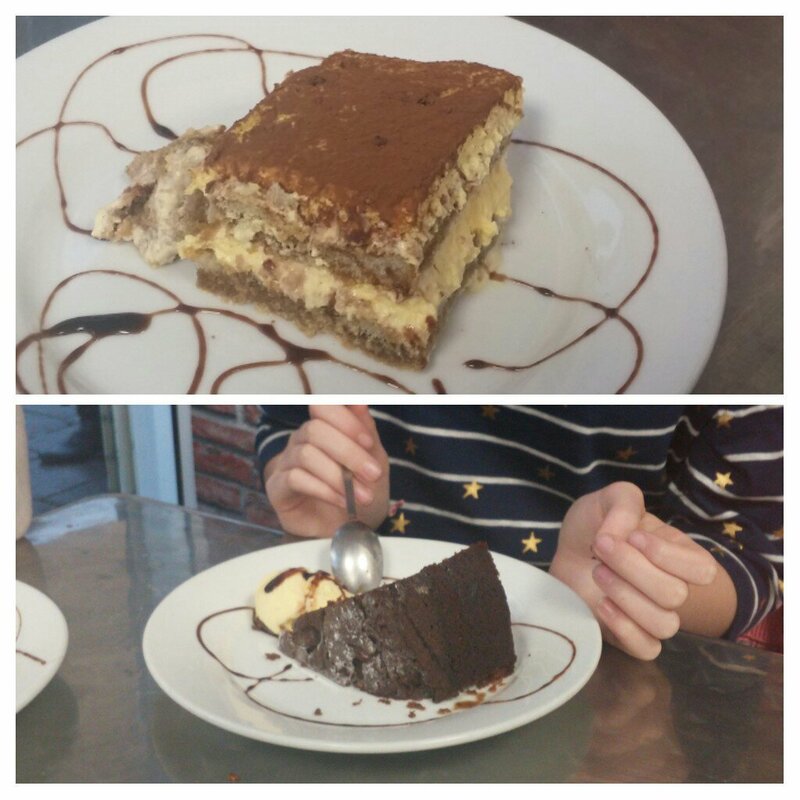 Cake, profiteroles and, that trattatoria staple, tirimisu. Mrs. SF said the latter was a good boozy number and one of the better ones she has had. The other desert ordered was chocolate cake and ice cream. As with a couple of the starters, this was OK without wowing. On the booze front there is a decent selection of Italian beers, spirits and soft drinks. An Italian friend swears by chinotto, personally I think it is ghastly. On the wine front the list is quite limited with seemingly very good value house wines (£12.50 a bottle – not sure of quality but no review I have read says it’s awful), as well as a few specified bottles. The ubiquitous Pinot Grigio (some good, most pretty grim), as well as the more interesting falanghini, primitivo, valpolicello and two specials in the form of a verdiccho and a bardolino are on the list. 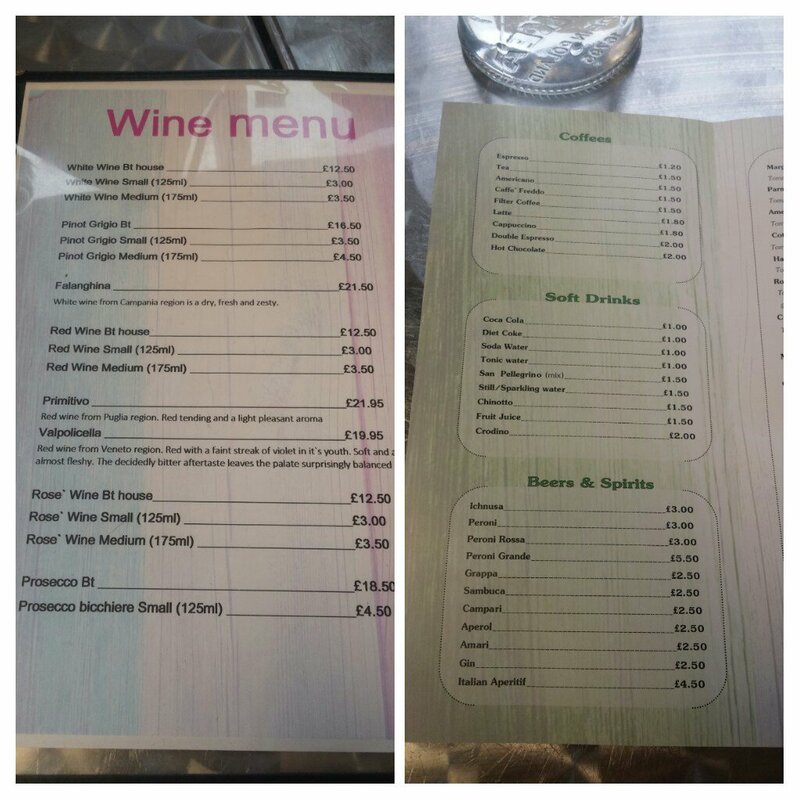 Nothing hideously pricey, with all the identified wines coming in at £21.95 (bar from the pinot grigo which is £16.50). 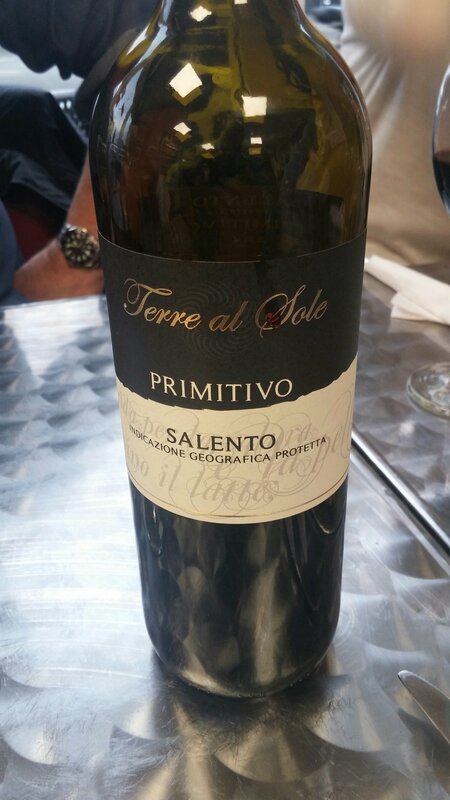 We went for the primitivo (2 bottles), which worked well with all of the mains and most of the starters. It had nice ripe black hedgerow fruits and plum on the nose and palate, with a slight touch of bitterness and some grippy tannins. Stuff retails at just over £9, so the mark up applied was not too bad. It certainly went down pretty well with the food. Proceedings were finished off with some very good, turbo charged, espresso coffee. 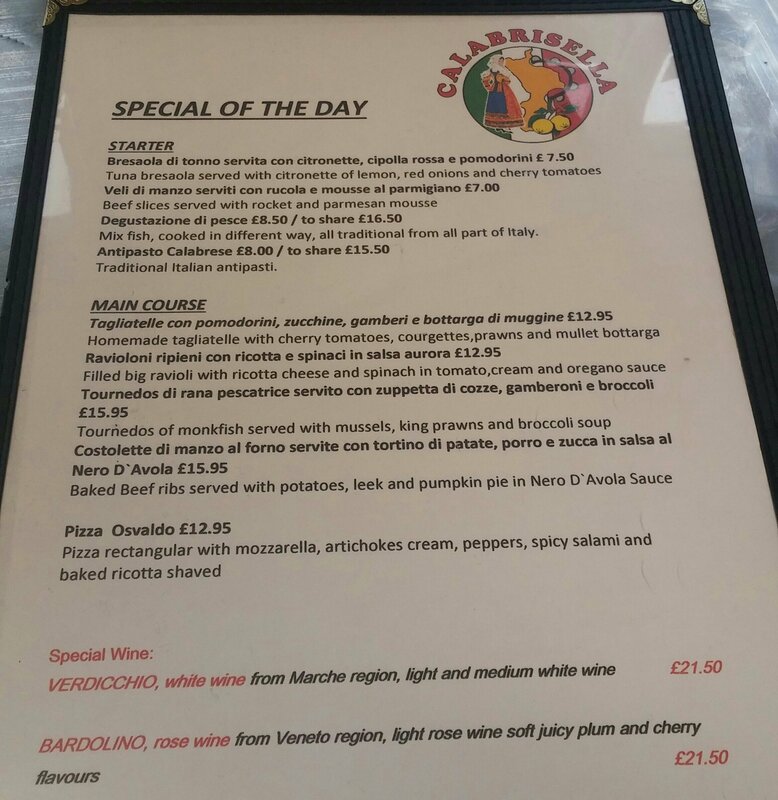 Despite a couple of slightly dull starters, we all really enjoyed our visit to Calabrisella. Within a somewhat ropey exterior and interior sits a really rather good little Italian. 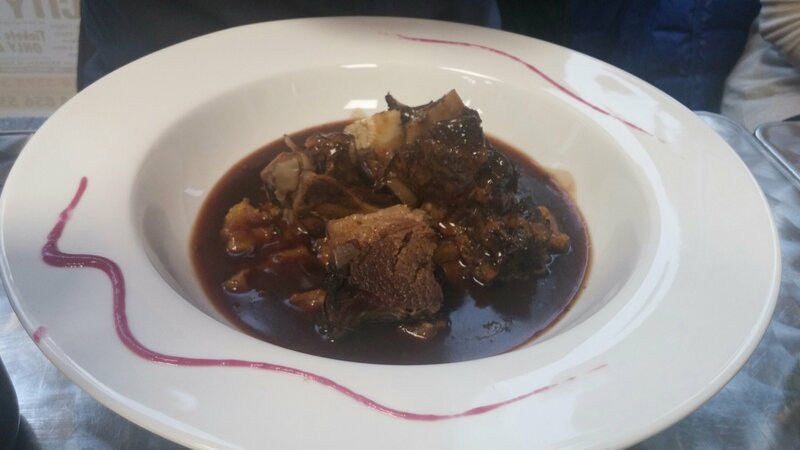 More than just good pizza, with the beef rib special showing the kitchen really can cook. Pasta coming out of the kitchen to other tables also looked very good. 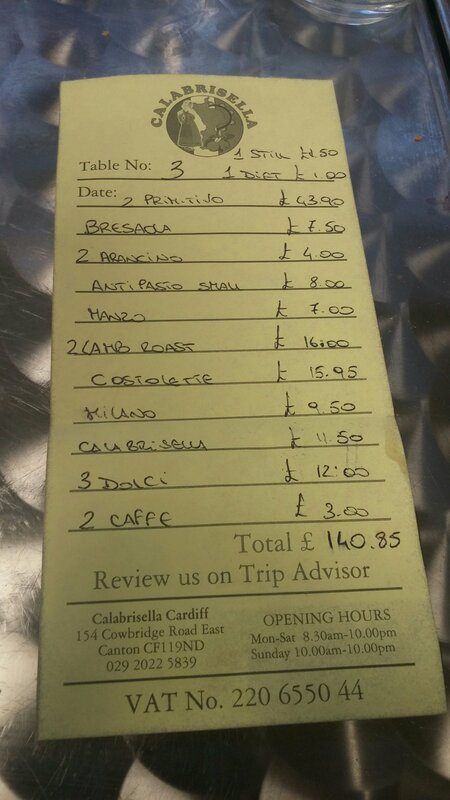 The bill for 5 people with starters, mains, puds, coffee and a fair bit of booze was just over £140 (take out the booze and it would have been under £100). I though this pretty good value for what we got. Would I go back? 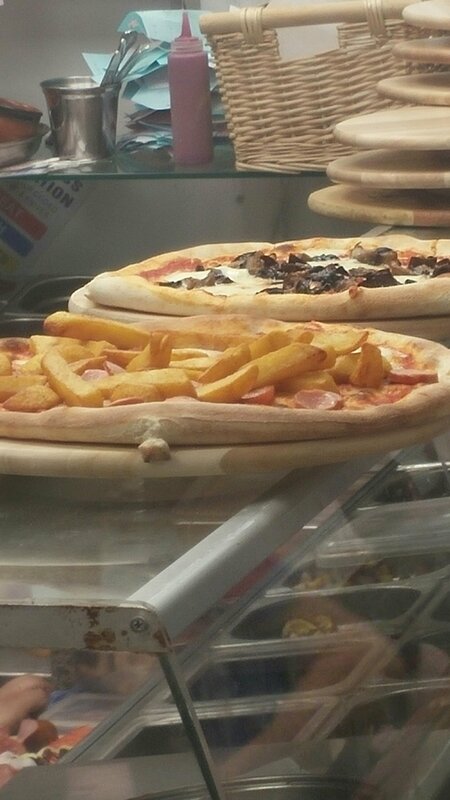 Good pizzas, bargain arancini and a great special will have me definitely returning. My advice is forget the unpromising facade and give it a go, if you haven’t already. Make sure you book though – place gets very busy. 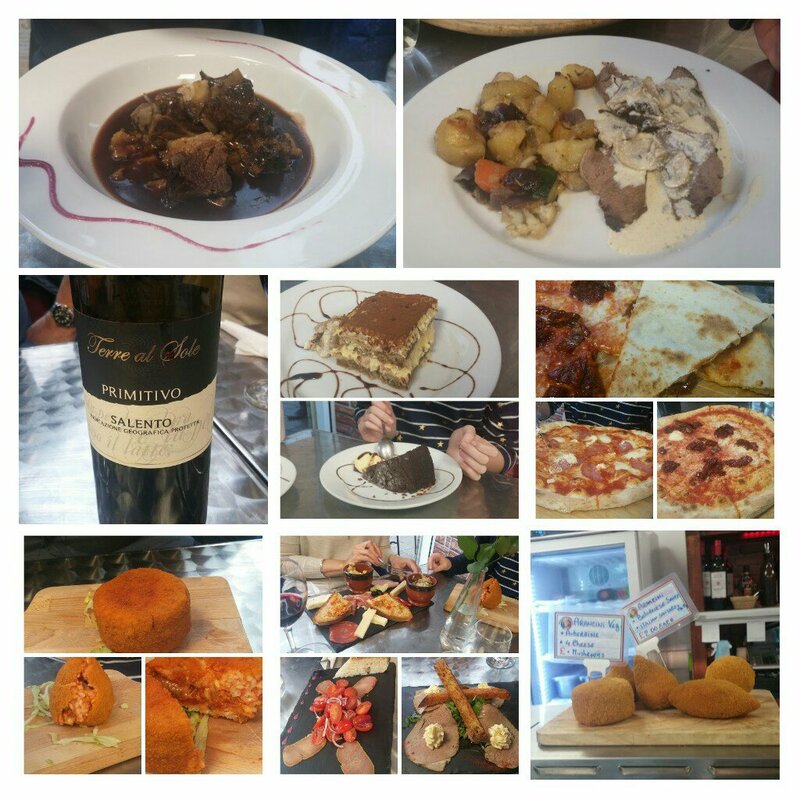 This entry was posted on May 7, 2017 by solicitingflavours in Alcoholic drink, beef, Beer, cafe, cake, Calabrisella, Campania food, Campania wine, Canton, Cardiff, Cardiff restaurant, charcuturie, cheese, coffee, curing, desserts, Drink, Dry white wine, Fast food, fish, Food, Food and wine products, Ice cream, Italian, Italian wine, Italy, meatballs, Non alcoholic drink, Pasta, Primitivo, Red Wine, restaurant review, review, Ribs, seafood, Sunday lunch, Sunday roast, Take away, Takeaway, Uncategorized, Wales, White wine, Wine, wine mark up, wine pairing, wine pairings.